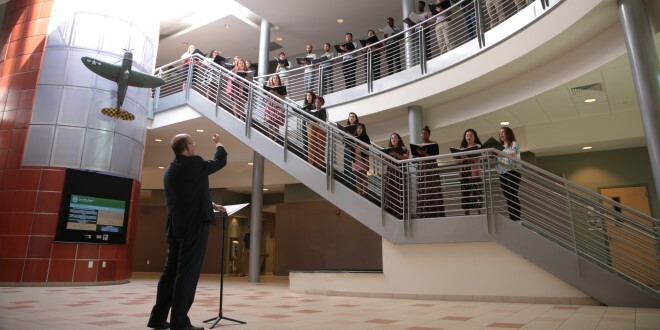 Dr. Timothy Snyder conducting Linda Berry Stein College of Fine Arts vocal students in an impromptu campus concert, A Little Lunch Music at the Davis College of Business. 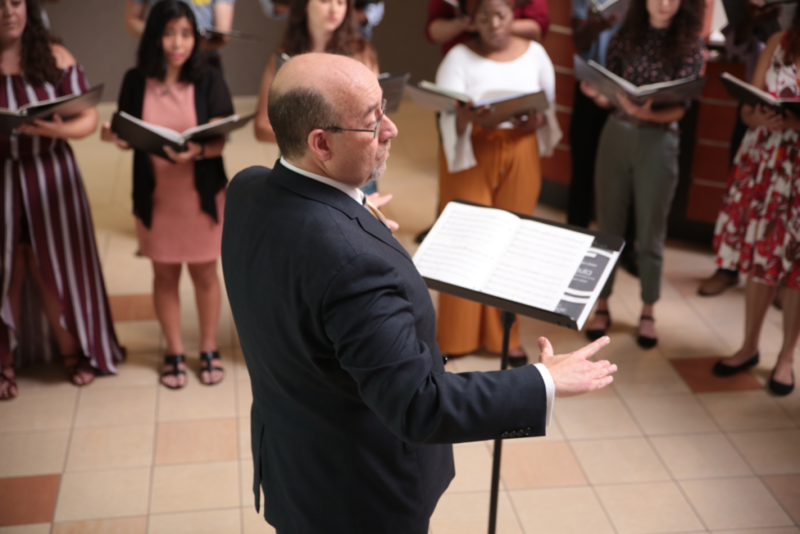 Continuing its commitment to elevating the standards of collegiate fine arts education, Jacksonville University, a premier private institution located in northeast Florida, has named Dr. Tim Snyder, a distinguished choral conductor, music educator and researcher, Dean of the Linda Berry Stein College of Fine Arts. Dr. Snyder has served as associate professor of music and Director of Choral Activities at Jacksonville University since 2010, as Chair of the Division of Music since 2016 and as acting Dean of the Linda Berry Stein College of Fine Arts since June of 2018. Under his leadership, the College of Fine Arts has enriched its programming in music, theatre, dance, film, and the visual arts. 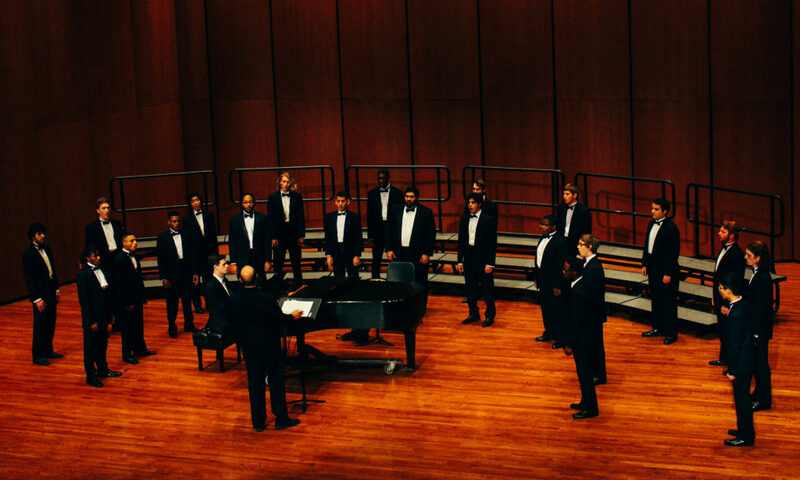 During his tenure, the Jacksonville University choral ensembles have earned a reputation for innovative, global programming and artistic excellence as evidenced by numerous invitations to perform with the Jacksonville Symphony Orchestra and two international choral tours. France in 2013 and the Vatican in 2016. Dr. Snyder was also instrumental in collaborating with Jacksonville University Trustee and alumna Linda Berry Stein to design the Stein Artist Scholars Endowment and other key programs that will be funded by the Steins’ recent multi-year, multi-million-dollar naming gift. Among his many accolades, Dr. Snyder was honored with the Faculty Excellence Award for Teaching at Jacksonville University both in 2013 and in 2018. Prior to joining Jacksonville University, Dr. Snyder held teaching and conducting positions at Connecticut College, the Metropolitan State College of Denver, the University of Colorado and Yale University. He conducted the historic Yale Glee Club and founded the Yale-New Haven High School Choral Festival. The City of Boulder honored Dr. Snyder with its 2008 Pacesetter Award for contributions to the arts and entertainment in the community, in recognition of his work with the Boulder Chorale. Dr. Snyder is passionately engaged in the field of music education as an associational member of many state and national organizations and is an active composer of choral works that are performed around the country each year. “The appointment of Timothy Snyder as Dean of the Linda Berry Stein College of Fine Arts will ensure the legacy of artistic excellence at Jacksonville University that Dr. Frances Bartlett Kinne established decades earlier. Dr. Snyder is widely respected as a teacher and choral conductor, and the visionary leadership and experience he brings to his decanal responsibilities will serve both the institution and the arts well,” said Dr. Robert Blocker, Yale University Henry and Lucy Moses Dean of Music, Professor of Piano and affiliate Professor of Management. 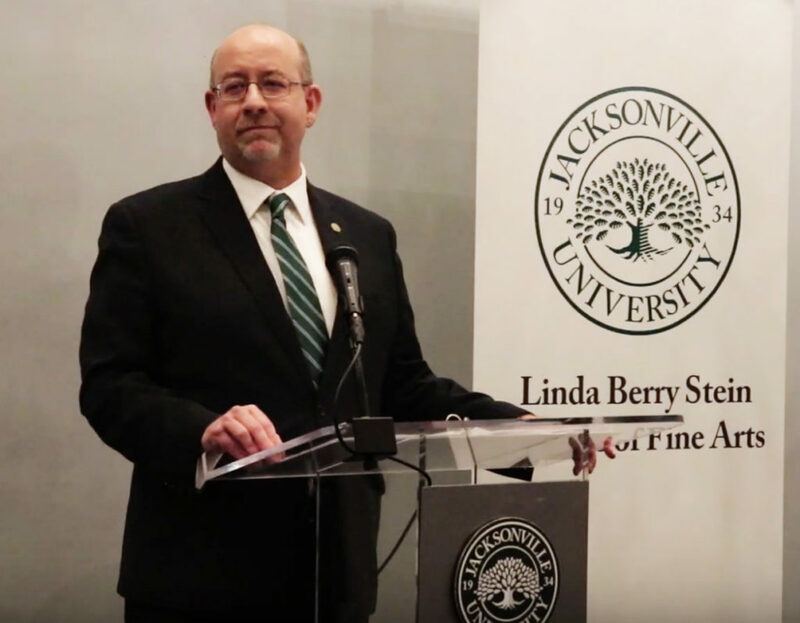 “I was so thrilled to hear of Dr. Snyder’s recent appointment to the deanship of the Linda Berry Stein College of Fine Arts at Jacksonville University. Thrilled – but not surprised. Since I’ve known Tim in graduate school at the Yale School of Music he has always been a stand out human being – smart, warm, engaging, supportive and one my favorite people to work with. Wherever he went Tim created a wonderful sense of community. Without question, Jacksonville University recognizes these exemplary qualities and is putting them to great use. 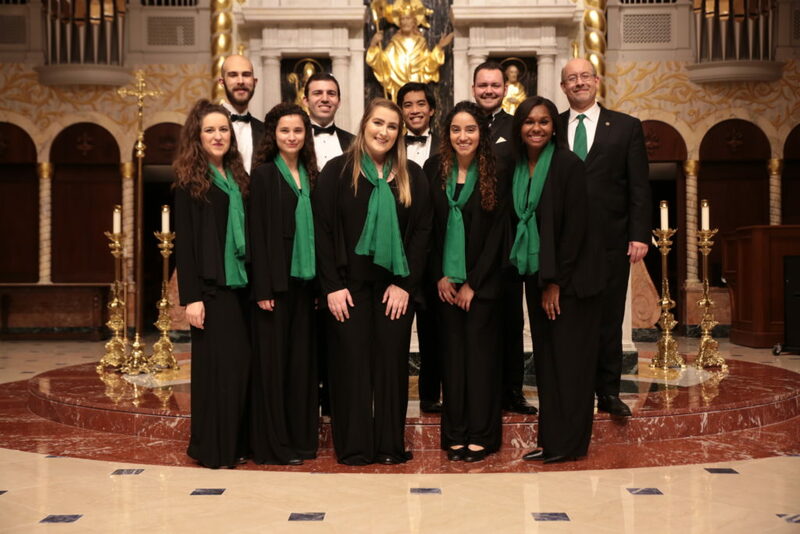 Congratulations to both Dr. Snyder and to the Jacksonville College of Fine Arts,” said Brad Wells, founder and director of the Grammy- and Pulitzer Prize-winning vocal ensemble Roomful of Teeth. “It is overwhelmingly apparent that Dr. Snyder embodies the Cathedral Arts Project’s founding principle that the arts matter and he has been a wonderful advocate for advancing our mission of providing comprehensive visual and performing arts instruction for underserved students in our community. He has provided opportunities for our students, faculty and many other partners to connect with the University as a community resource for arts, culture, and education. In his own students and in ours, Dr. Snyder’s work develops the creative thinking, perseverance, teamwork, and self-discipline that come from arts education at its best and in doing so we all benefit exponentially,” said Allison Galloway-Gonzalez, chief program officer and executive director of Any Given Child for the Cathedral Arts Project, Inc.
“The successful and longstanding collaboration between the Jacksonville Symphony Chorus and the Jacksonville University choral ensembles is a testament to Dr. Snyder’s talent as a music educator, scholar, and conductor. Under his leadership, his students are inspired to attain both the artistry and professionalism required to succeed as working performers,” said Don McCullough, choral music composer and the Director and Tom Zimmerman Endowed Chair of the Jacksonville Symphony Chorus. “Dr. Snyder’s breadth of understanding, not only of the musical direction of the Boulder Chorale, but of the kind of administrative support needed to strengthen the organization was amazing. He is a fine human being, and I believe his impact on the Boulder Chorale, including the Children’s Chorale that he helped found, has strengthened the organization as it continues to move on past its 50-year mark as Boulder’s largest and oldest choral organization. The Chorale is well-recognized in the community and regularly attracts new singers while maintaining a high level of ongoing singers among its ranks,” said JoAn Segal, former Executive Director of the Boulder Chorale. Dr. Snyder and Mrs. Segal led the development of a strategic plan for the Chorale that restructured the Chorale, positioning it for success and creating the well-recognized Boulder Children’s Chorale. “Jacksonville University not only supplied me with a world-class musical training but also a unique and passionate musical entrepreneurial spirit. Dr. Tim Snyder’s supportive but rigorous teaching style – coupled with his unwavering passion for music and the arts – helped me to become a successful and enthusiastic graduate, composer, and person. His attitude as a teacher, and now as the Dean of the Linda Berry Stein College of Fine Arts, helps promote the idea that Jacksonville University students don’t become working musicians when they graduate – they’re working musicians the moment they step on campus,” said Daniel Farrell, who earned his Bachelor of Music in Composition and Theory at Jacksonville University last year and is now pursuing a Master of Music at New York University. Farrell, a composer, arranger, and conductor, was the recipient of Chamber Music OC’s Emerging Artist award and a finalist for Kaleidoscope Chamber Orchestra’s 2018-2019 Call for Scores. One of his original compositions premiered in 2018 at the Valencia International Performance Academy and Festival in Valencia, Spain. “Every coach I’ve encountered since my years at Jacksonville University – from coaches at the Metropolitan Opera in New York and the San Francisco Opera to those in Italy and Argentina – has said the same thing: music is more than black dots on the page. It’s about taking what you see and creating, building, experiencing what those notes actually mean. That is why Dr. Snyder is so special – he showed us just how dramatic and emphatic the pieces truly can be, and he taught us to care and converse with the music. That kind of approach is invaluable in this industry,” said Brittany Nickell, Jacksonville University Bachelor of Music (2012) and Manhattan College of Music Master of Music and Professional Studies. She participated in the 2018 Merola Opera Program as part of the Opera Center in San Francisco; is a past winner of the Female Encouragement Award at the McCammon Voice Competition in Fort Worth, Texas; a recipient of The Opera Index Award at The Opera Index Competition in New York City; performed as a Regional Finalist in the New York City district of the Metropolitan Opera National Council Auditions; and was a finalist for the inaugural Premier Opera Competition in New York City. “Dr. Snyder is a true gift to Jacksonville University. With all his students, he has established trust, kindness, and great care for what matters in and beyond the classroom. He is a rare choral conductor for his meticulous rehearsal-planning balanced by compassionate musical direction and textual understanding. All this combined with his heart for life-long learning, and his commitment to actively loving people makes him a life-changing mentor,” said Allison McClain Merrill, Jacksonville University Bachelor of Arts in Choral Education and English (2016) and Yale University Master of Religion and Music (2019). Allison and her husband Jack first met in Dr. Snyder’s University Singers chorus at Jacksonville University. JU 2017 Chorale Festivale, Dr. Timothy Snyder conducting, Jackson Merrill accompanying. “Dr. Snyder is a musician and teacher of consummate intellect and skill. His expertise as a choral musician is matched by his facility as a mentor. A true Renaissance man, Dr. Snyder is the embodiment of Jacksonville University’s commitment to the liberal arts curriculum, with knowledge of poetry, history, philosophy, and mathematics informing his music teaching. He was a life-changing figure for me and many others,” said Jackson Merrill, who was also a former assistant conductor for Jacksonville University’s premier chorus, University Singers. He now serves as the Director of Music Ministries at Trinity Church in Hartford, Connecticut.